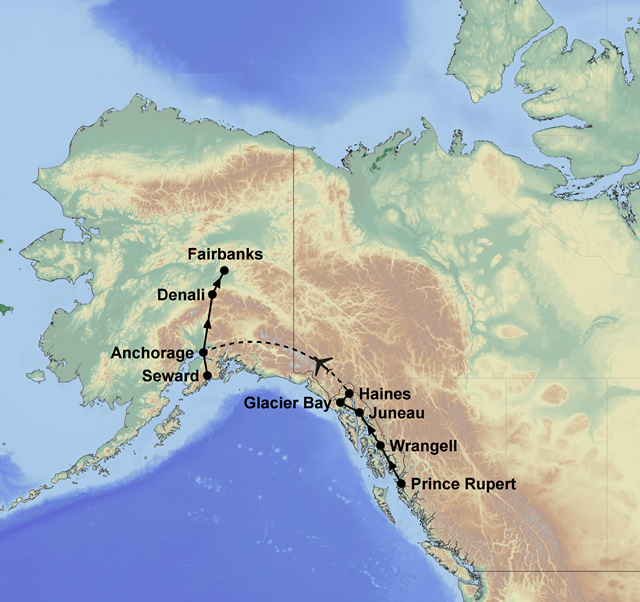 From Prince Rupert up to Fairbanks, this 16-day tour is a great overview of the real Alaska. Travel on the Alaska Marine Highway Ferries as you explore the Inside Passage. Travelling “off the beaten track”, you’ll see bears, take a glacier cruise, and be awed by snow-capped mountains. With two magical trips on the famous Alaska Railroad, the scenery won’t disappoint. Tours include a Kenai Fjords cruise, and Denali Wilderness tour. Accommodation in clean and comfortable hotels with private facilities, Meals as indicated (B=breakfast, L=lunch, D=dinner), AMHS fares: Prince Rupert/Wrangell, Wrangell/Juneau, Haines/Juneau, Stikine River Wilderness Cruise, AnAn Bear Observatory, Return transfer: Gustavus/Glacier Bay Lodge, Light plane flight: Juneau/Gustavus, Gustavus/Haines, Glacier Bay Cruise, Chilkat Bald Eagle Preserve Float Tour, Alaska Railroad: Anchorage/Seward, Denali/Fairbanks, Alaska Sealife Centre, Kenai Fjords National Park Cruise, Coach transfer Seward/Denali, Denali Tundra Wilderness Tour. The lower regions of the Stikine River include some of the most spectacular scenery in Alaska. This five hour tour by jet-boat takes you along some of the tributaries that connect with the “The Great River”. Travel by jet-boat to the AnAn Bear Observatory where you will have the opportunity to safely photograph black and brown bears. Full day at leisure. The town has a relaxed feel that allows visitors to wander comfortably and converse with locals from the town. This full day cruise covers the western arm of Glacier Bay providing excellent opportunities to view marine and wildlife including whales, seals, bears and moose. This tour begins with a narrated bus ride into the Chilkat Bald Eagle Preserve. There you meet up with naturalist guides and board rafts to float quietly through the heart of the preserve. Full day at leisure. Set at the base of Chugach Mountains, Anchorage has many attractions including the Alaska Native Heritage Center, the Museum of Art and Ship Creek. Five hour cruise into Kenai Fjord National Park. The park is home to orcas, humpback whales, sea otters and many species of birds. This tour provides an opportunity to view the magnificent scenery that makes this wilderness region so famous. 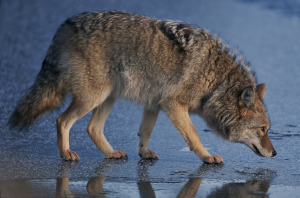 Keep a close watch for wildlife such as bear, moose, wolves, caribou and Dall sheep. Depart from Fairbanks to head home or continue on your holiday.